The ongoing Herkimer Police crackdown continues, with the arrest yesterday of an apparent drug gang member in front of landlord Jay Smith’s 332 Pleasant Avenue. The arrest, by Herkimer and state police, occurred at the start of Pleasant Avenue’s annual Spring Gang Swarming, a Herkimer tradition usually not challenged by police. This year was different, with an arrest that ended the festivities before they grew. Last year’s Spring Gang Swarm was sponsored by the Joyce Barton gang, its centerpiece the beating of herkimerpost.com’s editor by Herkimer street thug Shianne Hill. 4.7.19 Herkimer Police interrupt beginning of village’s Annual Spring Gang Swarming, this year hosted at Jay Smith’s 332 Pleasant Avenue by remains of the Stanley Sykes gang. Herkimer and New York state are aggressively challenging Herkimer gangs’ sense of ownership of village neighborhoods, this amid booming area real estate sales. As we long predicted, people are relocating to climate change safe Upstate New York. It’s a truism that as real estate values increase, crime decreases. 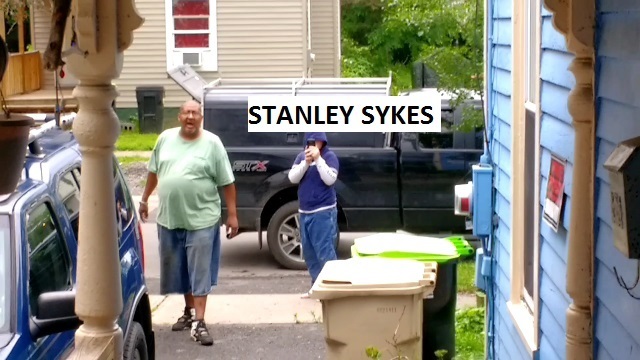 This gang appears to be the remaining dregs of the Stanley Sykes Gang, which trafficked children out of Jay Smith’s properties at 332 and 334 Pleasant Avenue and 341 Eureka Avenue. 4.7.19 Herkimer gang member arrested in front of Herkimer Post cameras. Herkimer and NY State Police officers participated. Gang members number about 11, with more in the process of joining them for the annual Herkimer Spring Gang Swarming. Then the police arrived. Police activity along Herkimer’s Pleasant Avenue has recently been constant and vigorous. A few days ago, Joyce Barton gang member, Joyce’s daughter Kylee Figueroa , was arrested at 333 Pleasant Avenue. Earlier on the day of this arrest at 332, multiple state and Herkimer police units responded to an incident at the King Street end of Pleasant Avenue, a few doors down from PK’s Pub. The house they entered remains cordoned off as a crime scene, with Herkimer police continuing to guard the property. Perhaps sometime the local press will tear itself away from its usual gripping coverage of 4H and village trustee meetings to tell us what happened. 332 Pleasant Avenue was reoccupied as a gang property in January, with intermittent drug trafficking activity occurring since. Additional gang members appear to have moved in there recently, or else are visiting so often and for so long as to be indistinguishable from residents. Herkimerpost.com hasn’t reported their activities: they haven’t bothered us and aren’t trafficking children, and we’re very busy with a major project. Federal law enforcement surveillance drones are a regular presence over the parking lot serving 332 and 334 Pleasant Avenue and 341 Eureka Avenue, making any coverage of trafficking we’d provide redundant. But any arrest here on Herkimer’s Pleasant Avenue is always welcome news that we’re happy to share. Here’s the video of the arrest. The timeline follows below. 0.01 Gang congregates at Jay Smith’s 332 Pleasant Avenue, spilling out onto the sidewalk. 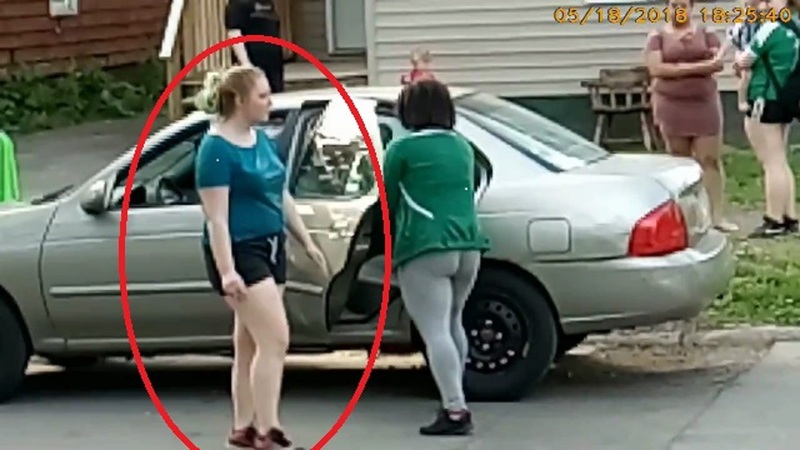 Opposite, standing next to parked car: Shianne Hill, Joyce Barton gang thug, serving 1-year probation for unprovoked beating of her 63 year-old neighbor. Hill has been placed under a restraining order. 0.27 Gang member (woman in red top) hands off her daughter to fellow gang member from 334 Pleasant Avenue. Child taken to Jay Smith’s 334 neighboring Pleasant Avenue. Red Top’s a well-known and highly visible drug trafficker. 4:24 Herkimer officer appears to offer protesting gang member (Black guy, red shirt) a ride in a police car.